this car commits a Fiat sin! its like the Seicento Abarth and Cinquecento Abarth. its not Mad enough, yet its not plain either, it just looks like its trying too hard. Abarths should be like Abarths of old like the old 500 (I think) where it over heated so they just welded the bonnet open, that's an Abarth and anything wearing an Abarth badge and its not wheel spinning sideways into a car park on fire is just not an Abarth. Last edited by mariocinq; 17-04-2015 at 16:44. Beyond sub zero!!!!!! 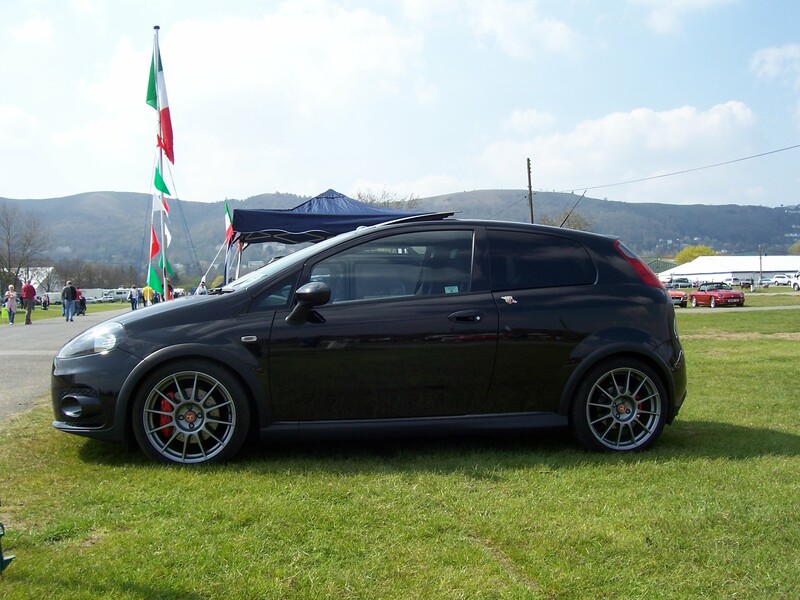 The only Grande Punto that's as cool as the Eleganza! this made me actually lol, like literally. i tend to agree but i think its cooler than the 500A and it has potential... I wouldn't want or get one now, but in 10 years i reckon we would all love a AGP - heavily breathed on one thats actually fast though. I don't know, it's pretty mad in EsseEsse trim - 180bhp through the front wheels - it will try to throw you into the hedge if you hit the loud pedal too brutally. You can't really get into the back due to the seat thickness, and the rear seats don't fold more than 45 degrees for the same reason. Keeping a tradition of impracticality! Your EsseEsse is possibly the best AGP I've seen, No gaudy decals but still capable of ripping your head off, it is also posibly the lowest milage AGP on the road. i been in a APE supersport and driven an AGP essesse and it just felt a bit boring to me.. I know its not slow or anything but crucially it didn't feel particularly fast. I embarrassed a lad in on with my old seicento turbo and pretty sure a mk1 GT would utterly destroy one.. The engine is good though, throw some tuning things at it and it can make really impressive numbers but out the box it feels lacklustre to me and lacking excitement. All this is of course just my opinion, i can see why people like them and stuff but for me they need to age another 10 to 15 years and then i suspect i will really want one lol. You weren't driving it right then!! The EsseEsse is quicker 0-62 and top speed than a mk1 GT. It is extremely docile until prodded. A couple of people have tried mine & thought it wasn't that quick as a passenger - it nearly threw then into the hedge despite my warning! The early Grande looked a bit flimsy inside, but the Abarth always gets compliments about the quality of the fit & finish. Are you sure it was an Abarth? Last edited by Palio; 19-04-2015 at 00:03. Yes i'm sure haha.. Like I said though, its not that its not fast more that it didn't feel fast. Actual numbers are different to feel is what i am getting at, I don't like the feel. Had the same with a few cars, prime example would be when i almost bought a Alfa GTV V6 - Pretty car, and on paper well specced with a great engine. 220+bhp, loads of torque, scrambles to 60 in under 7 seconds blah blah but if you actually sit in one and poke it with a sharp stick it really doesn't feel like its going as fast as it is - and i had the same thing with the AGP, to me it just didn't feel quick and exciting. Not convinced its faster than a GT either, yep its got 50ish bhp on a GT but on paper they both have almost exactly the same 0-60, top speeds mean nothing in real life. And the GT just feels like its trying to headbutt the horizon by comparison to me. I'm really not trying to knock the AGP at all, I don't mind it as a car and it looks immense - just i walked away disappointed by it whereas when i first got in a GT i was properly shocked and impressed by it. But its all this is my personal preference on cars and how they should be and feel. Last edited by blu73; 19-04-2015 at 00:44. They really aren't that quick, even the essesse is something like 7.7 seconds to 60? it should have been in the mid 6's standard, where the focus st's are. The fact the Abarth 500's are quicker than the AGP just compounds it. Fiat made a massive mistake there. But they do have a certain coolness to them all the same, fast enough for what it should be or not. I agree, my point is more that it doesn't feel quick and on paper, it isn't as quick as it's rivals, so it's really a double whammy. If it was the speed it is, but had a rawness to it, it'd feel more "alive" and faster, or it could be faster and not feel fast but at least on paper it was, as it is, it's neither.